Urticaria is also known as hives, weals, welts or nettle rash. It commonly affects around 1in 5 people at some point in their lives, referred to as hives, is the frequent dermatologic disorder seen in the emergency department (ED). It appears as raised, well-circumscribed areas of erythema and edema involving the dermis and epidermis that are very pruritic. 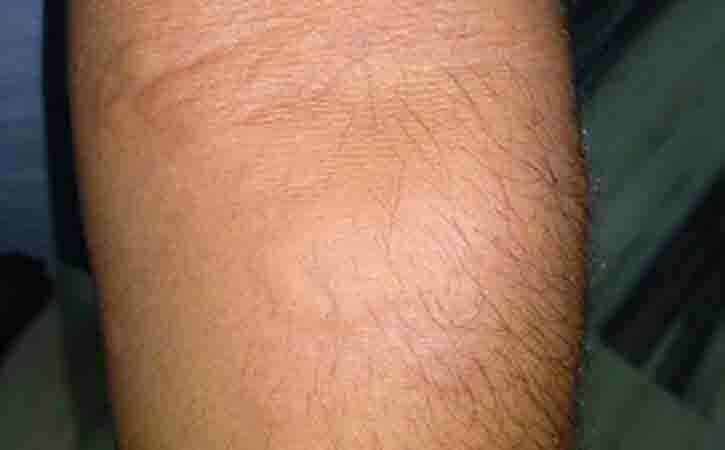 Urticaria may be acute (lasting 6 wk). A large variety of urticaria variants exist, including acute immunoglobulin E (IgE)–mediated urticaria, chemical-induced urticaria (non-IgE-mediated), autoimmune urticaria, cholinergic urticaria, cold urticaria, mastocytosis, periodic fever syndromes including Muckle-Wells syndrome, and many others. While acute urticaria is generally related to an exogenous allergen or acute infection, chronic urticaria is more likely to be associated with autoimmunity. Urticaria may be confused with a variety of other dermatologic diseases that are similar in appearance and are pruritic including atopic dermatitis (eczema), maculopapular drug eruptions, contact dermatitis, insect bites, erythema multiforme, pityriasis rosea, urticarial vasculitis, and others. No variation in the race is noted. Incidence rates for acute urticaria are similar for men and women; chronic urticaria occurs more frequently in women (60%). Urticaria can occur in any age group, although chronic urticaria is more common in the fourth and fifth decades. A tendency for symptoms to persist for more than six weeks and to recur frequently and unpredictably, sometimes for months or years. Short-term hives appear suddenly and clear up within a few weeks. Urticaria occurs when a trigger causes high levels of histamine and other chemical messengers to be released in the skin. These substances cause the blood vessels in the affected area of skin to open up (often resulting in redness or pinkness) and become leaky. This extra fluid in the tissues causes swelling and itchiness. Doctors often can’t identify the reason for chronic hives or why acute hives sometimes turn into a long-term problem. Pressure on the skin, as from a tight waistband. In some cases, chronic hives may be related to an underlying illness, such as a thyroid disease or, rarely, cancer. The doctor will likely recommend treatment symptoms with home remedies, like antihistamines. If these steps don’t help, talk with a doctor about finding the prescription medication or combination of drugs that works best. Usually, an effective treatment can be found. Antihistamines: Taking non-drowsy antihistamine pills daily helps block the symptom-producing release of histamine. If the non-drowsy antihistamines don’t help, the doctor may increase the dose or have tried the type that tends to make people drowsy and is taken at bedtime. Like: hydroxyzine pamoate and doxepin. Check by doctor before taking any of these medications if the patient has pregnant or breastfeeding mother, have a chronic medical condition, or are taking other medications. Histamine (H-2) blockers: These medications, also called H-2 receptor antagonists, are injected or taken orally. Like: cimetidine, ranitidine and famotidine. Anti-inflammation medications: Oral corticosteroids, such as prednisone, can help lessen swelling, redness and itching. These are generally for short-term control of severe hives or angioedema because they can cause serious side effects if taken for a long time. Antidepressants: The tricyclic antidepressant doxepin, used in cream form, can help relieve itching. This drug may cause dizziness and drowsiness. Asthma drugs with antihistamines: Medications that interfere with the action of leukotriene modifiers may be helpful when used with antihistamines. Like: montelukast and zafirlukast. Man-made antibodies: The drug omalizumab is very effective against a type of difficult-to-treat chronic hives. It’s an injectable medicine that’s usually given once a month. Immune-suppressing drugs: Options include cyclosporine and tacrolimus. Chronic hives can go on for months and years. They can interfere with sleep, work and other activities. Avoid scratching or using harsh soaps. Soothe the affected area with a bath, fan, cool cloth, lotion or anti-itch cream. Apply sunscreen before going outside. Check by doctor before taking any of these medications if patient has a pregnant or breast-feeding mother, have a chronic medical condition, or are taking other medications.